Название: Taste of Home Diabetes Cookbook: Eat right, feel great with 370 family-friendly, crave-worthy dishes! 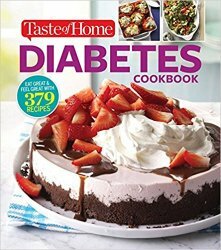 With Taste of Home Diabetes Cookbook it’s a snap to serve mouthwatering sensations that everyone at the table will savor…whether they’re following a diabetic diet or not. Inside this all-new collection, you’ll find 370 mouthwatering dishes, each accompanied by a complete set of Nutrition Facts and Diabetic Exchanges. All of these must-try recipes were reviewed by a Registered Dietician, tested at the Taste of Home Test Kitchen and approved by a tasting panel—so they’re ideal for everyone! Best of all, these recipes come from today’s family cooks who are happy to share the satisfying favorites their families adore!